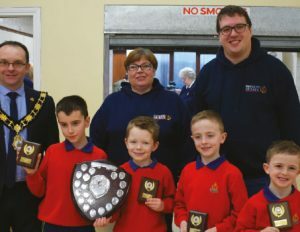 Congratulations to the boys from 1st Armagh who won the 2018 Anchor Boy Fun & Games competition, which was held in 1st Antrim on Saturday 27 January 2018. Cllr Paul Hamill, Mayor of Antrim and Newtownabbey Borough Council, attended the event and presented 1st Armagh with their shields (above). Congratulations also to 16th Newtownabbey who were Runners-up and 1st Knocknamuckley who finished in 3rd place. Well done to all boys and leaders who participated, it was a fantastic morning.